Our community’s Annual Symposium will take place at the University of Wisconsin-Madison’s Discovery Building on June 21 and 22, 2018 (plan to travel to Madison on June 20). 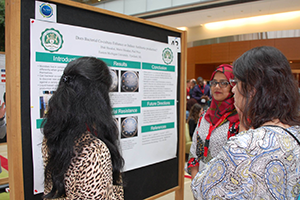 The 2018 Symposium will feature our annual poster competition, highlight innovative research and discovery across our community, and serve as a connection hub for Tiny Earth’s student-scientists and implementing instructors. The Symposium is jam-packed with opportunities for students, instructors, and other supporters to take our program to the next level. We are pleased to partner with Wisconsin Athletics to explore the impact of antimicrobial resistance on collegiate athletes and athletics. The Symposium will feature guest speakers from different antimicrobial resistance-relevant backgrounds. Attendees will hear from leaders across industry, academia, and healthcare. The program will include “tapas talks”, a series of short presentations on an exciting array of topics, from new lab methodologies implemented in Tiny Earth courses to special projects that extend our reach beyond the university classroom. After a catered lunch and keynote address, the annual poster competition will commence. Day 1 will conclude with a fun reception dinner for Symposium attendees. On Day 2, attendees will choose to start their day with a program either at a Madison-based life sciences biotech company or on campus at Camp Randall, UW-Madison’s Division I football stadium and training facility, with UW-Athletic trainers, doctors, and student-athletes. By midday, Symposium attendees will reconvene at the Discovery Building for lunch and the Tiny Earth Career Expo featuring representatives from graduate schools, professional schools, life sciences companies, and biotech firms. The Symposium will conclude with an award ceremony and closing remarks.